It wasn’t easy for Montse Cancino-Aguilar to leave the southside of Chicago for Knox College in Galesburg. She knew that Knox was a good school and a place to grow. But interacting with people different from her was new, and she was often homesick. Fortunately, she says, Knox stresses diversity, inclusion and open-mindedness, ideals that were important to her, she says. Cancino-Aguilar makes the most of her Knox education. 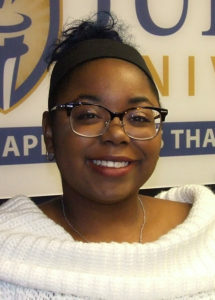 When not in class, she is treasurer of Lo Nuestro, a cultural club focused on Latino awareness, a member of Delta Delta Delta sorority and an alternate resident assistant. 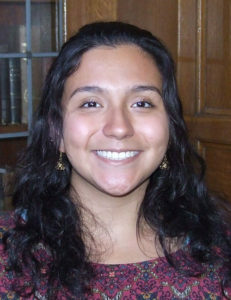 She also works in the college’s financial aid office, where her bilingual skills are helpful. Wright-Bell, from Glendale Heights, Illinois, says for the past 13 years, her mother has been missing, a reason why she studies psychology. “I kind of wanted to help other children who might feel alone like in my situation, not having a parent. I wanted to be sure to let them know there is someone there that cares about them,” she says, adding she has a specific interest in child advocacy. To supplement her education, Wright-Bell has interned at the Elgin Boys and Girls Club, which she describes as a safe place for students after school, providing meals and homework help. She is also a member of the university’s Spirit Squad.